Reveal your inner queen with our Queen of Diamonds Body Scrub. This luxurious blend of nature’s sweetest exfoliant, coconut oil, and shea butter will leave your skin glowing and as soft as your velvet cloak. 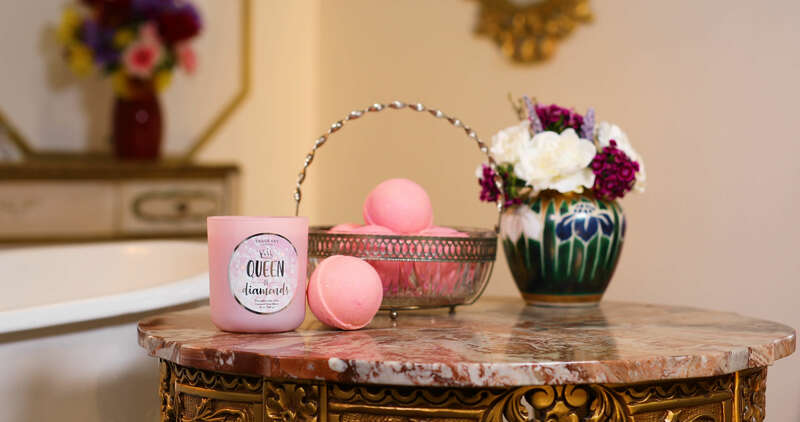 Hints of royal orchids, mandarin blossoms, and waterlily will make you feel like you’re strolling through the royal gardens of Windsor Palace for hours to come! As if that won’t make you the envy your kingdom, each body scrub reveals a gorgeous crown-inspired ring and a code with the chance to win a ring worth up to $10,000 through our Enter the Vault Sweepstakes! Let them eat cake! Inside every Body Scrub, you'll find one of 10 exquisite crown-themed silver-toned rings! Massage onto skin with warm water. Rinse to reveal glowing skin! Caution: May make surfaces slippery. Keep out of reach of children and pets.